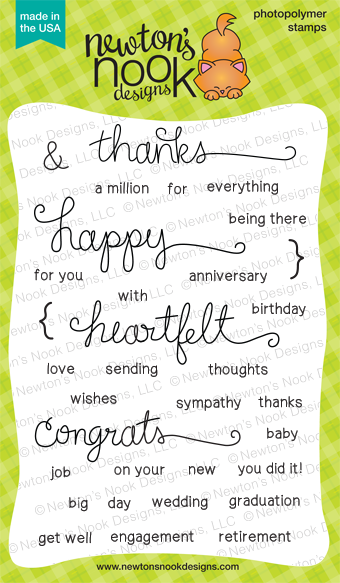 Here is my card with the first new release, "Simply Sentimental"
your chances are of winning! -- winners will be announced on the blog post on Wednesday, August 20th. Very cute how you have Newton hanging from the sentiment. So cute. I like your coloring, choice of papers and the scalloped/ric rac border. Cute card made with new sera. Cute little card. Love your paper choices, the adorable cat and sentiment. Oh I just think this card is so adorable!! I LOVE newton hanging down from the sentiment!! So sweet!! And that yellow woodgrain paper...yes please!! Love this! So clever to use the tail of the words to hang the critters from! Love this fun layout with Newton! The bright colors make it such a cheerful card! Love that sweet Newton image! Cute card, and fun new sentiment set! So cute. newton looks happy hanging from the sentiment. Great card. Super great new release!! Love the sentiments!!! This card is cuter than anything!! Love the papers you used for a background behind Newton! Love the border at the bottom of the yellow square and the awesomely placed enamel dots!! This is extremely cute!! Love it a lot!